Hi, and welcome to my web site. I am an Australian textile artist, an author of four books and a tutor. I live and work in Melbourne in the state of Victoria, Australia. I specialize in machine work using appliqué, embroidery and quilting techniques. My designs are usually inspired by nature and are often embellished with braids or beads. 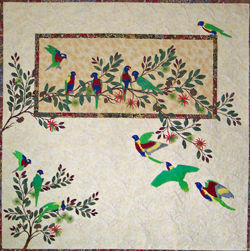 The header and this picture are photos of my quilt A Flash of Lorikeets (2004). All photos and text are the sole property of Eileen Campbell and are not to be copied or reproduced without permission.